2018 Veterinarian of the Year Dr. Thomas Newland (left) with presenter Dr. Ernie Ward at Petplan's Veterinary Excellence Awards. This year’s winners impressed the judging panel with the quality and variety of their services, commitment to their teams, passionate pursuit of continuing education and dedication to improving the lives of animals in their local communities. 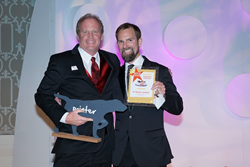 Petplan pet insurance hosted its annual Veterinary Excellence Awards dinner on February 2 at the Four Seasons Orlando Resort, naming six veterinary professionals—and one exemplary pet parent—2018’s winners. The event, held in tandem with the Veterinary Meeting & Expo (VMX), capped off a day that included a continuing-education speaker series called the Business of Medicine Conference, which was also hosted by Petplan. Nominees in each category were submitted by both professional peers and clients, and then each completed a rigorous application process to accept their candidacy and advance to the semifinalist and finalist rounds. The judging panel included North America’s most talented veterinary professionals, several of whom are award winners from past years. Now in its seventh year, Petplan’s Veterinary Excellence Awards celebrate the important work of America’s veterinary professionals, who go above and beyond providing pets with exceptional care and clients with outstanding customer service. Each year, Petplan gives each Veterinary Excellence Awards winner a $1,000 prize, plus a $1,000 donation to their animal charity of choice. This year, Petplan doubled the donations, for a total of $12,000 distributed to worthy nonprofits. To learn more about the 2018 winners or to nominate a pet health hero for the 2019 Awards, please visit Petplan.com/vet-awards. Petplan has built an industry-leading pet insurance policy for pet parents who demand a higher pedigree of care for their best friends. We’ve leveraged 40 years of global experience to create completely customizable coverage pet parents can feel confident in, and world-class claims service that operates 24 hours a day, every day. Petplan’s innovative approach to pet insurance has been recognized by Forbes, Financial Times, Bloomberg, Inc. magazine, Smart CEO, the Communicator Awards, Ernst & Young and many others. Petplan policies are underwritten in the United States by XL Specialty Insurance Company and in Canada by XL Specialty Insurance Company-Canadian Branch. The company is rated A+ by S&P (2018). Coverage may not be available in all jurisdictions. For more information about Petplan pet insurance, visit http://www.petplan.com or call 1.866.467.3875.